Today I am featuring a mustard bell sleeve knit top by Sweet Grey. 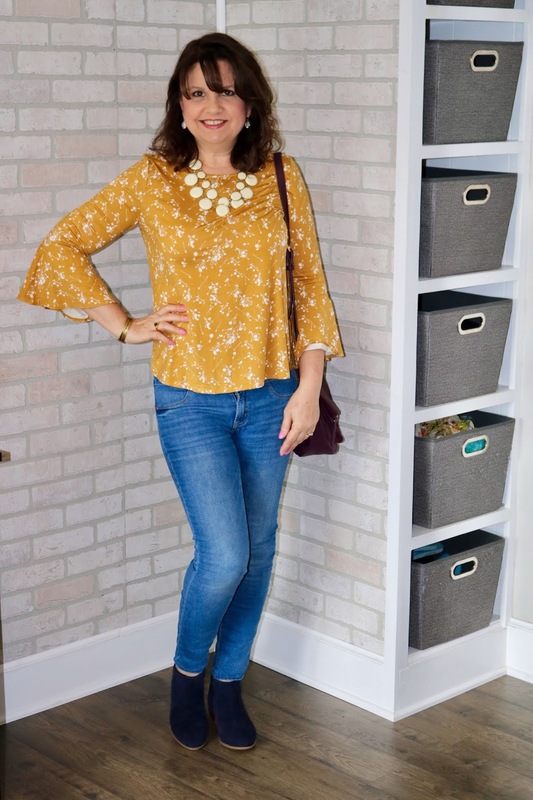 As I started to write this post, I realized, totally by accident, that every single item I'm wearing, with the exception of the jeans, is from Stitch Fix. Some of these items are from my very first boxes I received years ago. That just goes to show you the longevity of Stitch Fix pieces when you choose wisely what to keep. The top is a soft knit material with a small white floral pattern. I liked everything about this top except how you could see the white underside of the material in the bell sleeve. I wish they would have lined that part of the sleeve. Other than that, it fit great, I loved the drape, and I thought it was very flattering. I styled the top with high waist skinny jeans from Charlotte Russe. I am so bummed they went out of business. I really liked that store. They had a lot of unique items, I especially liked their jeans and shoes. 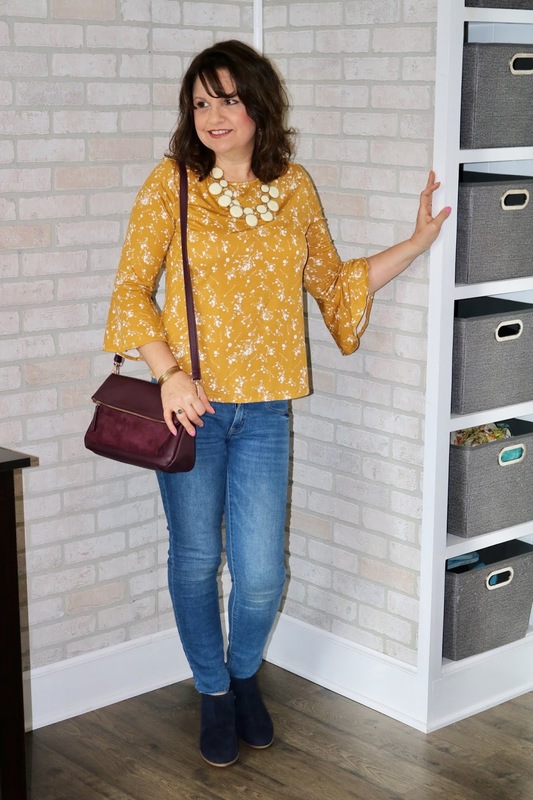 The burgundy bag, also from Stitch Fix, coordinates well with the mustard yellow of the top and brings in more color too! 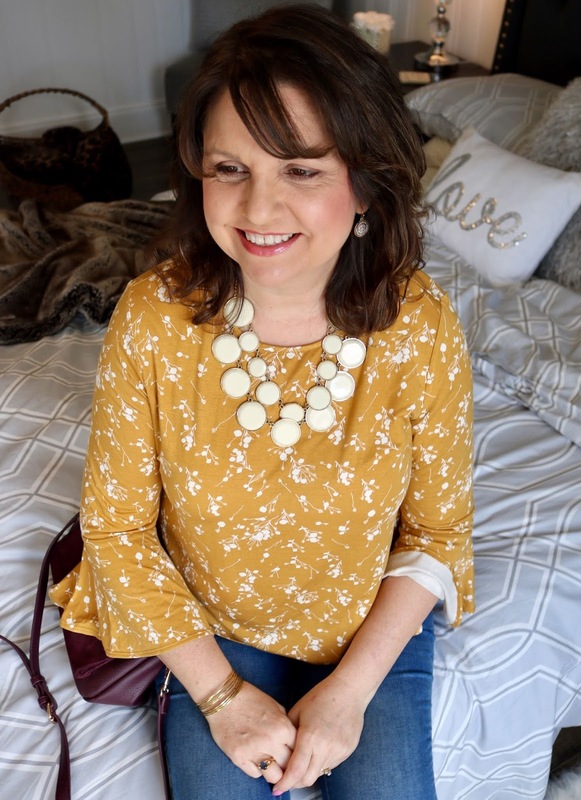 The necklace, bracelet, and earrings are all from Stitch Fix. The necklace and bracelet are two of my oldest Stitch Fix items. I don't get to wear this necklace often as it is so large and difficult to style, but it sure went well with this top! 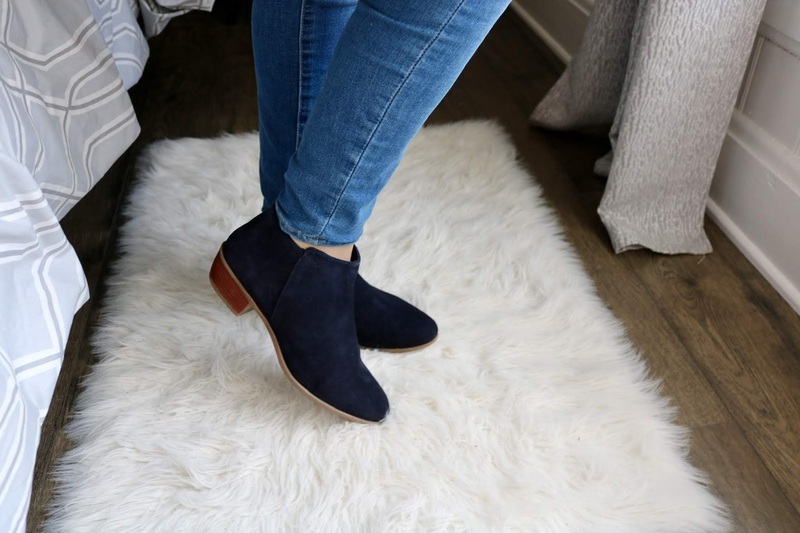 My blue suede booties I received from Stitch Fix a few months ago but I haven't been able to wear them much with all the snow and rain. I thought they went great with this outfit, and I'm looking forward to getting more use out of them this spring and fall. I received this top in my April box. 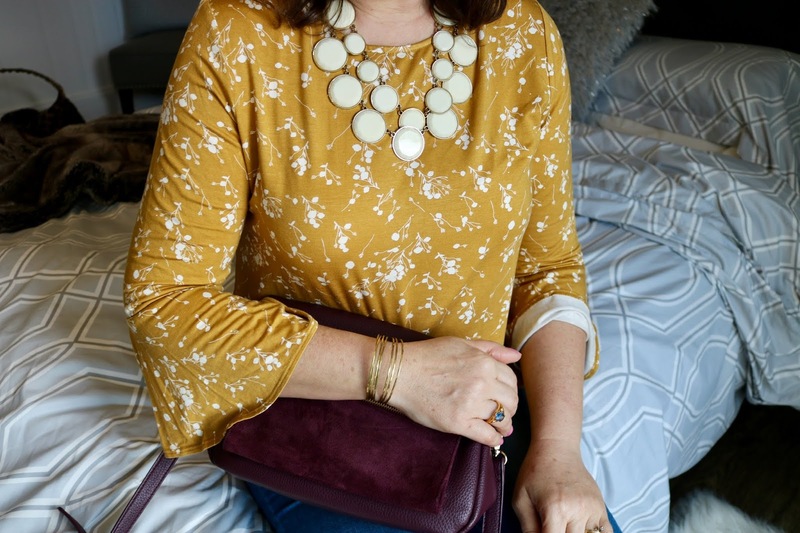 I'll let you know in my Stitch Fix Review Post in two weeks if I kept or returned the top. That color is so fun, Amy. In fact, I'm pulling out that gold color to take on our trip this week. It seems to go with everything else I'm taking!! Yes, it's a fun, different color I don't have much of in my closet. Have a great trip! It looks great on you, Amy. I agree the necklace goes so well with the outfit! I recently bought a shirt in that color, it's not a usualy go- to color for me, but so fun for a change! Sad that so many stores are closing these days! I have to admit I am no help with that because I realized that the reason why I hate shopping in stores is because barely any of them carry my size (xs and short/petite in pants or dresses). It's so much easier for me to shop online to find the things I am looking for. Thanks Ellie. Yes, I never understand why stores don't carry more sizes. I think I have the opposite problem than you, I'm an average size. I generally wear a medium, which is always the first size of everything to sell out. Every time I go shopping I see a ton of XS or XL, XXL, Large, and never a medium. Yet when I go online everyone complains there is not enough large sizes. I don't get it. CJBanks is the worst. Everything in our local store that's usually left is plus size. I can only order on line from them. I don't get why stores can't order more of the popular sizes, like a medium, and less of the super small or large sizes. Your top is so flattering! I love the print! Those blue suede booties are also fabulous! Such a pretty blouse on you- I love that mustard is really having a style moment! 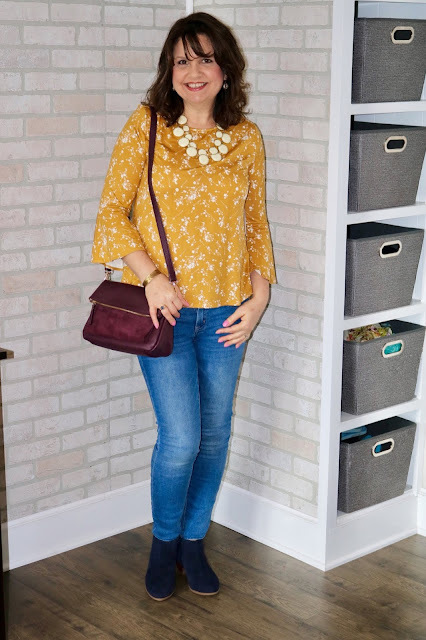 I am loving mustard color this year. Cute! I hope you end up keeping this top! It's really cute on you especially with the white accessories! You’ll find out soon! Thanks so much! 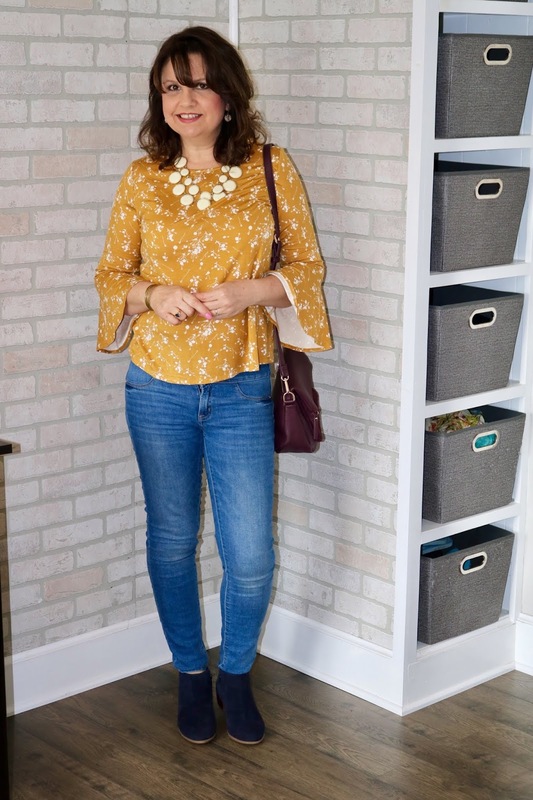 such a lovely mustard top. I do like the bell sleeves! love you in yellow! And these pictures really capture your joy! Thanks! Hubby was telling me jokes making me laugh. 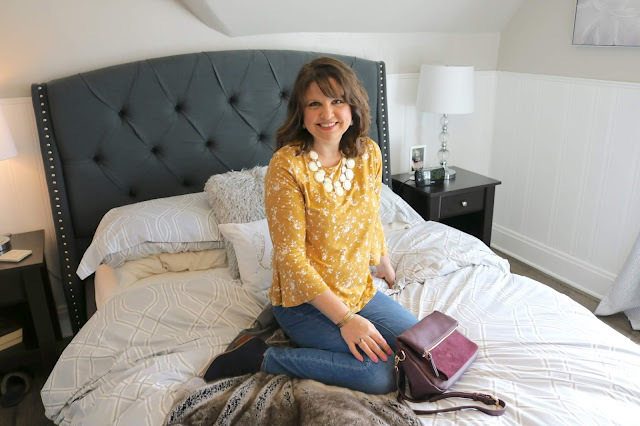 What a great top Amy, love the mustard color on you. Neat to see that these pieces are serving you well through Stitch Fix. That is such a cute top! I hope you kept it, I like the sleeves and the colour! I wish I could wear statement sleeves more often but it's hard when you clean up with and play with toddlers all day, haha! Thank you Mica! You'll find out on the review post on Friday!